Classes started this week which meant the majority of touristy things were confined to the weekend so week days could be spent getting lost on public transportation (not me, of course) and exploring our classes. They give us two weeks to wander between classes trying to decide which to take. That also gives us plenty of time to learn to navigate the seventeen story building with an elevator that only goes to three different floors and figure out how to register for classes. The rather simple instructions they emailed us were very different from what actually needed to occur, other than the final step of pushing the “confirmar” button. Luckily there was still time to see the city so my friend and I headed over to the Casa Rosada which is similar to the White House, except pink; and, unlike the White House, the president only works in the Casa Rosada. It’s a pretty big building with super lax security. The bottom floor has paintings and statues of famous figures in Argentine history. We toured around for a bit reading about some of the famous figures and looking around the courtyards. There are many guards on duty throughout the Casa Rosada and despite the serious looks on these guys’ faces, it’s actually only for the picture. They were joking around with each other seconds before, such pros. I can’t make a serious face on command, I always start laughing. We tried to go to the Museo de la Ciudad, which was supposedly this pretty cool museum right next to the Casa Rosada, but they were renovating it. Across the way was a Franciscan museum so we also tried to go there but it was just closed so we ended up just seeing a nice franciscan church. 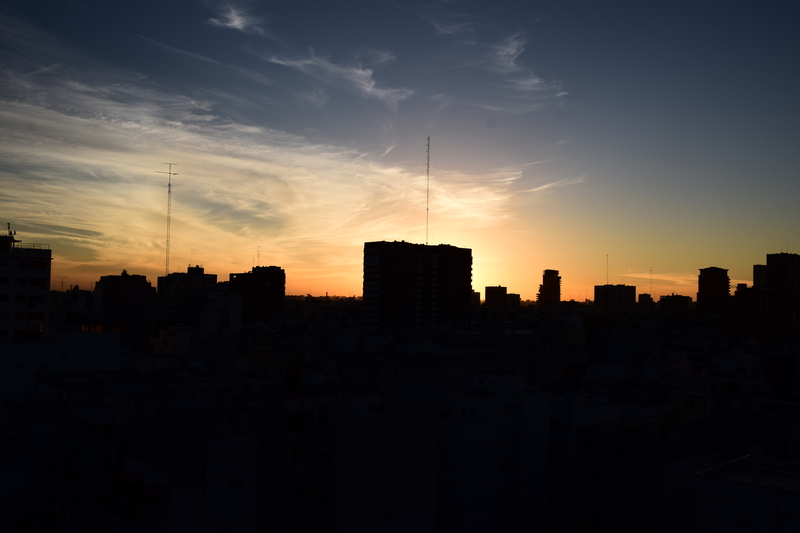 The “ferias” in Buenos Aires are pretty famous and a great way to spend an afternoon, or a whole day. The San Telmo Feria is famous for its antiques and occurs every Sunday, it’s essentially a craft fair that runs about two miles through the city. We didn’t manage to walk all of it because our feet were exhausted and we wanted to grab lunch. However we did see some pretty awesome things along the way. This was a street performance by this little orchestra. They sang beautifully but I was most struck by the three accordions chilling in the front row. They were excellent at playing the accordions and most of them played incredibly animatedly. In addition to the handmade and machine made crafts, the main section of the feria was an antique fair. We found a lot of really cool old things, different types of old currency from around the world, China sets, lots and lots of nazi memorabilia and these really cool telegraph sets. My friend tapped out a message but neither of us actually know what he was saying, nor was there anyone on the receiving end. Among the non-handmade crafts we found a teeshirt stall and both of us were quite struck by this one. I figured it’s a great shirt to wear when you first return from studying abroad because most people’s first reaction is, “Oh hey! I haven’t you in so long! You were studying abroad right? Which country again…?” At which point, I could just point to this teeshirt and put some attitude into the response. Just kidding! As with the venders in Israel, occasionally they give me free things in an attempt to make me buy their goods. I stopped by this vender’s booth to look around, and he chatted with us for awhile, and then made me a shooting star ring that flattens out into a pretty handy bookmark. I showed it off while we were eating lunch in a nearby pizzeria/sandwich shop. 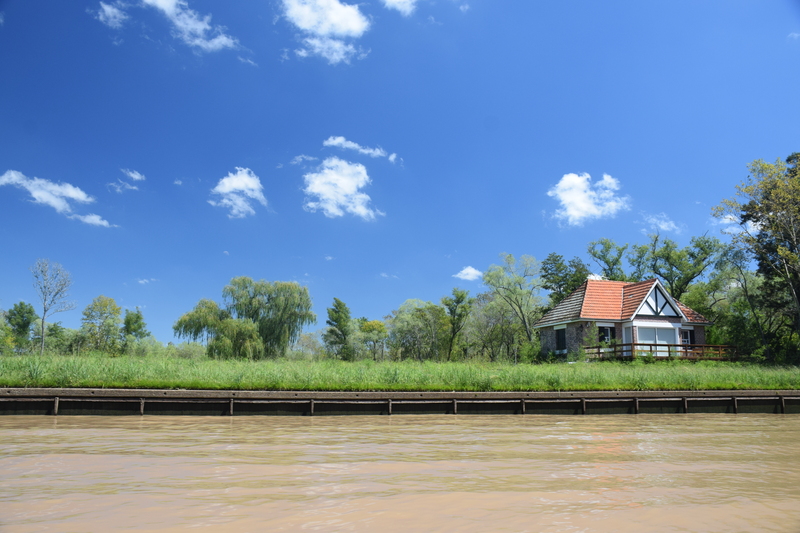 On Friday, we headed north of the city to Tigre, a small city and also a huge river delta. We spent the morning canoeing through the river and visiting other various sites before swimming in the river. It was an absolutely beautiful day and I was chilling in the front of the canoe for the second half of the ride. The world’s best canoe team ^^ This is Casa de Sarmiento, the house of an important historical figure who we also saw in the Recoleta Cemetery. 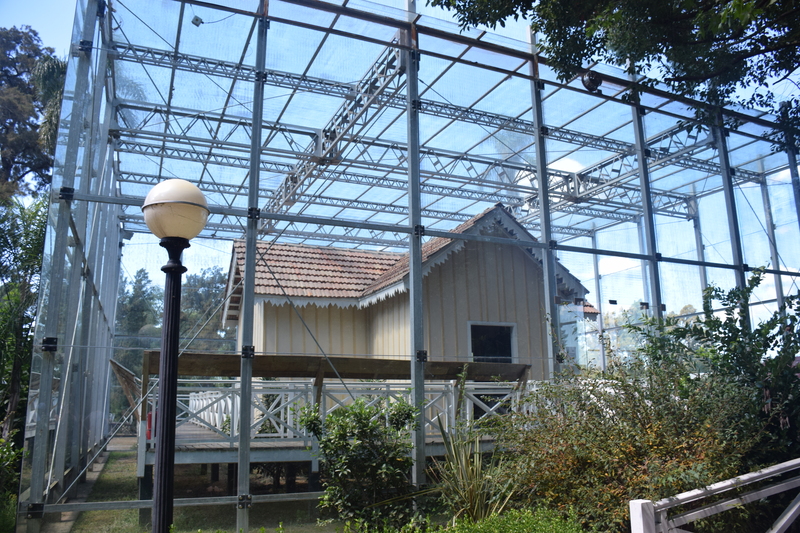 In an attempt (we think) to preserve the house, they rebuilt it slightly smaller and encased it in glass. This was our last stop before spending the day jumping off docks, laying in hammocks, and relaxing in the perfect waters of the tigre river delta. I took this on the way to swimming. Totally unreal, huh? Aw man, check out that nice city sunset. Now that I have really truly mastered public transportation here, you know. I thought I’d chat more about it*. One on of my trips downtown my friend and I saw this arabic writing on the wall, which, obviously, was slightly intriguing to me. As it’s fancy cursive there’s no way that I can read it so I sent it off to my Jordanian friends who told me it says “There is only one God.” I was a little curious how this came about and the only thing I could find was that lots of muslim folks immigrated to Buenos Aires in the early 1900s along with the Italians and the Spaniards. Although the influence of the Italians is obvious in the manner of speaking, surnames and food here; and the influence of the spaniards is prevalent in many of the buildings, this was the first I’d seen of islamic influence which was pretty cool. *#datcitylyfe: (All precision USD) Like all good big cities, there’s a pretty extensive public transportation system here that makes it easy for students to get around. The most complicated of these is the bus system or “colectivos,” there are over 200 lines that will take you anywhere in the city for 30-40 cents. They stop when you flag them down or push the button, otherwise they careen through the streets in a way that would make the Knight Bus** proud. To learn how to use the busses you can buy a handy little guide that uses a grid system on a map of the city to show which busses pass through which sections and the na list of every bus number and all of its stops. It’s far more complicated than it sounds so most of the students use Como Llego, an app that takes your beginning address and destination and, much like google maps, tells you how you can get to your destination using busses or the subway. The subway runs under the city in five long parallel fingers with one line that runs across each of those along the knuckles and you can ride it for just 40ish cents. They’re working on expanding the lines so that there are more connections between them, currently the subway (subte) can really only be used to travel east-west unless you’re at city center. Luckily the subway passes right in front of my house and four blocks away from school. Incredibly counter-intuitively the subway runs opposite the traffic on the street which can get really confusing when you need to figure out which side to go down on. There’s a light rail that will take folks outside of the main Buenos Aires area to the outer provinces (which we took to Tigre) that costs like 20 cents. It’s pretty slow, but it has air conditioning. So far I’ve only used it once, I don’t particularly anticipate using it often. 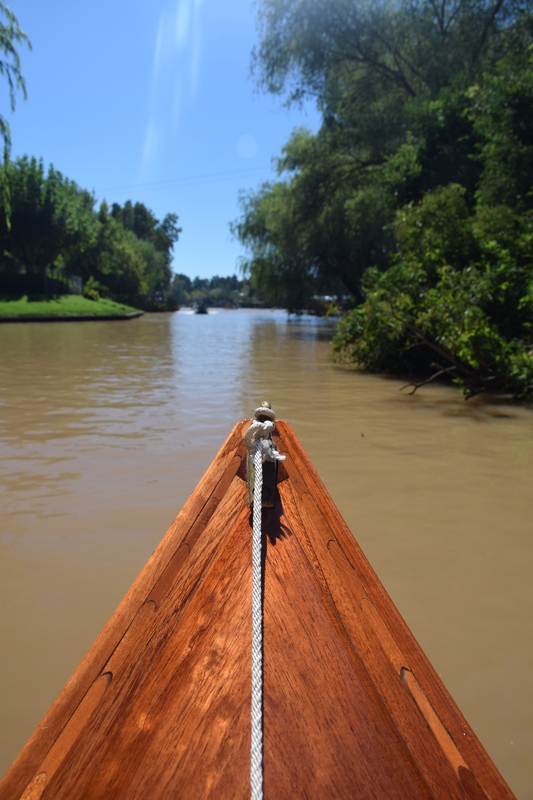 Out on Tigre there are lanchas colectivas which are essentially river busses in the form of awesome boats. We haven’t used them on our own so I’m not sure how they work, but technically Tigre is separate from Buenos Aires! The other form of transportation in the city is to get around by taxi. For the most part they aren’t too expensive (when compared to SF or NY taxis in any case). Usually a ride to anywhere we’d want to get within a ten mile radius of us is $5-$10, the only thing about the taxis is that you have to get one from a certified company. There are lots of sketch taxis around but it’s really easy to tell the difference.